The Tour de Fleece started on Saturday (spinning during the tour de France and posting on Ravelry). I forgot to post on Saturday, and then on Sunday a powerful storm ripped through the Chicago area causing massive outages. We were without power for a day and a half. Luckily my neighbor had a generator that she graciously let us plug our basement refrigerator in to, which saved most of the food. And that meant that yesterday, in the heat, with no electronic entertainment, I cleaned out the upstairs fridge, and it looks great. 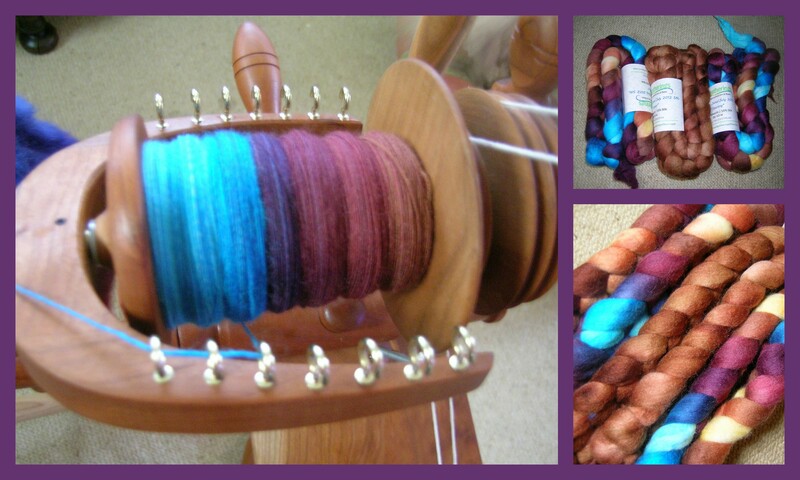 This is what I am starting to spin, from Woolgatherings, a roving painted for an SAL on Ravelry. After my classes with Jacey last weekend, I came home, and was able to take control over my Jensen wheel better, and spin a very fine lace yarn with this fiber. It will take me awhile to get through 2 braids, but I love the colors and have not decided if the second ply should be the other painted roving or the copper solid coordinate. 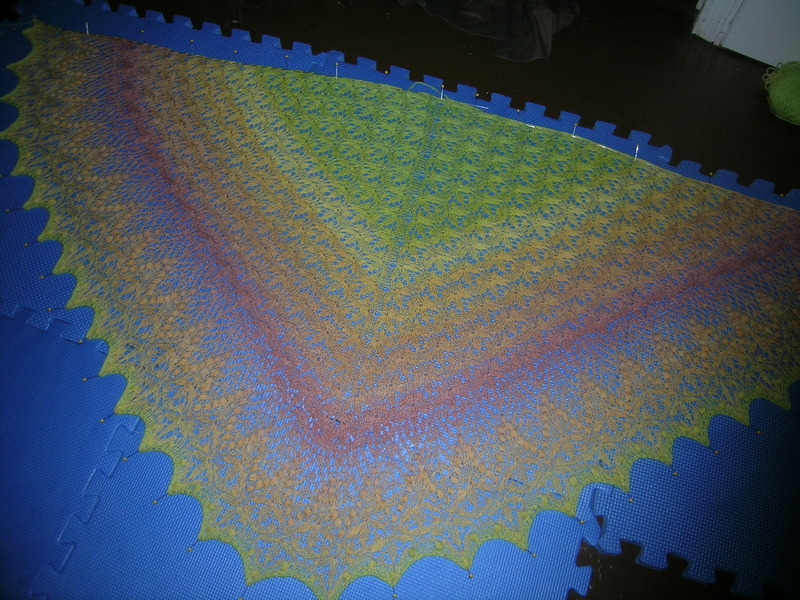 And I finally finished knitting my echo shawl. I think. I have ripped back the edging once completely and once partly, then added on to it. I was using 2 gradient spins back to back, and wanted to end up with the green as the bind-off. 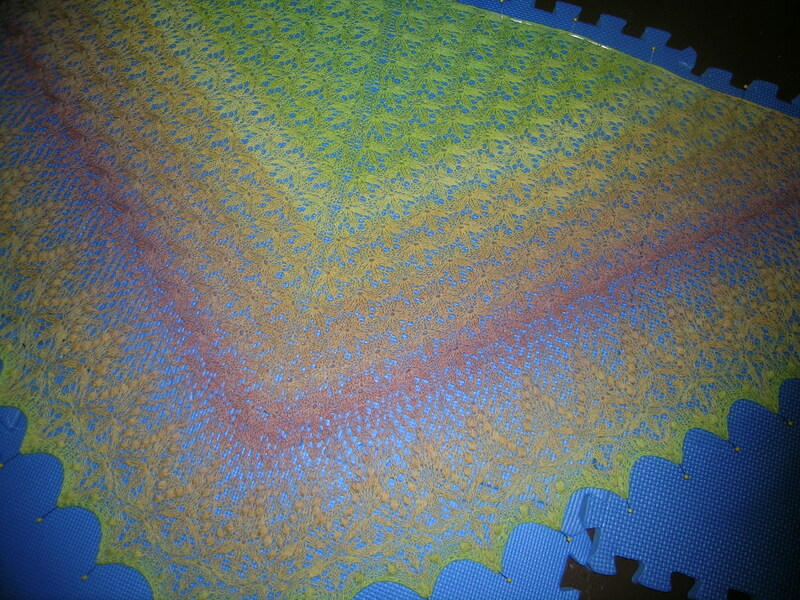 Just in case I still do not like it after it is off the blocking boards, I still have not cut the yarn from the skein. The colors are a bit off because of the blue blocking boards. Wow, love the photos! I was a little annoyed at my power outages on Sunday, but clearly should have felt fortunate, as my power was restored in a matter of hours. Glad you are back online…can’t wait to see what else you spin for the Tour De Fleece! Thanks! Our power went out AGAIN last night, but this time for only an hour. If it weren’t so dang hot, I would not be so worried.